OP being owned by its customers creates prosperity and wellbeing for its owner-customers and in its operating regions, in accordance with its mission. This is why owner-customer is at the core of our operations. Everyone can become an owner-customer by paying a cooperative contribution. It is a one-time contribution – no other payments exist. Owner-customers' rights come in two types: Owner-customers have the right to attend, and vote at, their OP cooperative bank's annual cooperative meeting or in the Representative Assembly elections. They can also run as candidates for their OP cooperative bank’s Representative Assembly and vote in its election. In addition, an owner-customer is entitled to OP's owner-customer benefits valid from time to time. Since 2014, our owner-customers have been able to invest in their own OP cooperative bank by means of Profit Shares. An OP cooperative bank will pay annual interest on Profit Shares on the basis of its financial performance, thus channelling part of its prosperity for the benefit of its owner-customers. OP anticipates paying interest of 3,25% on Profit Shares for 2016 (3.25% in 2015). In 2016, the number of OP Financial Group's owner-customers increased by 256,000 to over 1.7 million. The year 2016 was the second full operating year after Pohjola Bank was delisted and OP went back to its roots as a financial services group wholly owned by its customers. As part of building the new OP Financial Group fully owned by its customers, the previously limited liability company OP Helsinki operating in the Helsinki Metropolitan Area was converted into a cooperative bank. In accordance with cooperative principles, our administration system enables owner-customers to have an impact on decision-making and development of our operations. The owner-customers elect from amongst their number their own bank’s administrative staff. This ensures that the local bank’s operations are developed by taking its customers’ needs into consideration. Through their representatives in administrative bodies, owner-customers can promote businesses and prosperity in the region. Read more about OP cooperative banks’ local influence. In terms of the type of their business organisation, OP cooperative banks are cooperatives whose basic values underlying decision-making include the one member, one vote principle. The members, or owner-customers, elect from amongst them a Representative Assembly for the bank by voting in the assembly election. The Representative Assembly exercises the decision-making powers of the cooperative bank’s members in matters laid down in the Co-operatives Act and the bank's Bylaws. Where an OP cooperative bank has no elected Representative Assembly, the bank’s supreme decision-making body is its annual Cooperative Meeting. Many OP Financial Group cooperative banks will organise their Representative Assembly elections in 2017. Those who have become owner-customers by the end of June 2017 can vote, or stand as a candidate, in the election. Going forward, owner-customers will be able to influence the operations of the bank in their ownership in a variety of ways. In the autumn of 2016, the OP cooperative banks of Sastamala, Ruukki, Oulainen and Kainuu piloted a new digital customer community as a channel of influence for their owner-customers. An owner-customer community gives owner-customers an opportunity to have their say by answering surveys and by participating in discussions. In the pilot, owner-customers were asked to propose charity causes for their own bank and then vote for their favourite from amongst the suggestions received. In each bank, owner-customers selected a cause for supporting families with children living on limited means. The pilot will be expanded in 2017. OP cooperative banks will start using owner-customer communities in their respective schedules and will then invite their owner-customers to join the community. Owner-customers can also influence OP’s service and product design. In line with the cooperative principle, owner-customers benefit from OP’s operations and success. A considerable part of business earnings are returned to the owner-customers in the form of OP bonuses and various benefits and discounts. The more an owner-customer uses OP’s services, the more he/she benefits. 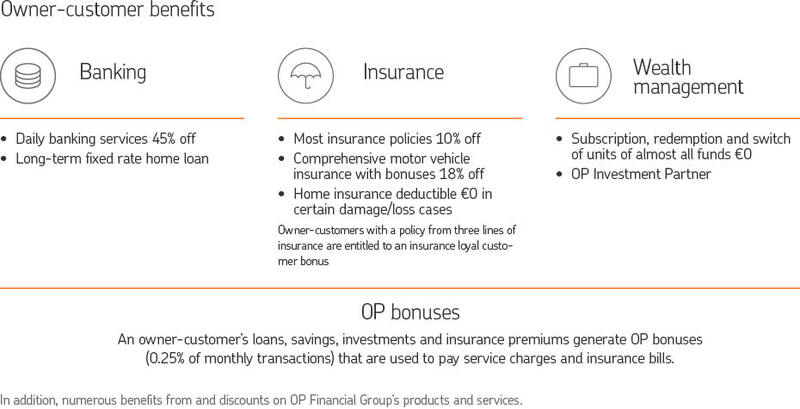 OP’s loyalty benefit programme consists of OP bonuses – generated in proportion to the person’s transactions with OP – as well as benefits and discounts related to OP’s banking, non-life insurance and wealth management products and services. Furthermore, some service packages are only available to owner-customers. OP bonuses are the most significant owner-customer benefit and they are generated from almost all customer transactions. 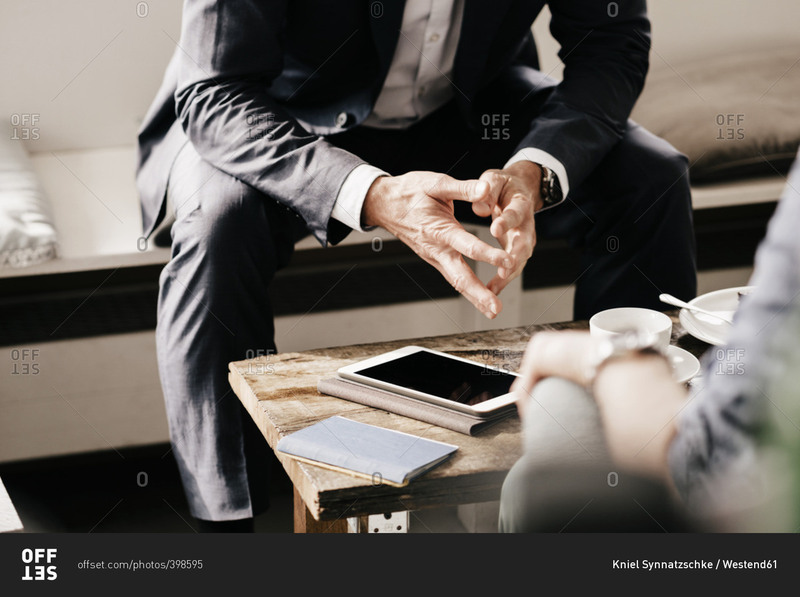 OP bonuses are widely applicable to OP Financial Group's banking charges, non-life insurance premiums and wealth management fees as well as OP Kiinteistökeskus real estate agent commissions. A total of 101 million (100) euros of OP bonuses were used to pay for banking and wealth management services and 107 million (101) euros to pay non-life insurance premiums. Since 1999, we have granted over 1.9 billion euros in OP bonuses. In 2016, our owner-customers earned a total of 208 million (197) euros in OP bonuses. Discounts given related to non-life insurance totalled 86 million (79) euros. OP bonuses were used to pay 2,200,000 insurance bills (2,023,000), with 297,000 (273,000) of them paid in full using bonuses. We are continuously improving our owner-customer benefits. The new mutual fund benefit was launched in June 2016 and it enabled owner-customers to buy, sell and switch the majority of OP funds' units with no transaction costs. We also introduced new services exclusively for our owner-customers, including the OP Investment Partner service package designed to support owner-customers in their investment decisions and the new fixed-term home loan, enabling our customers to tie, for the first time in Finland, their whole home loan to a fixed interest rate for the entire loan period, up to 25 years.